a good little light can make a BIG difference in any room. for example, we have a 3 bulb chandelier in our bedroom… it’s nothing special and recently we just switched the bulbs out. Australia is on the energy efficiency wagon (which i am 100% for) though that means that most new light bulbs take about 30 seconds to get to desired brightness. so, now – not only do we have a blah fixture, but we also have a room where it’s similar to a shower… you can’t go in right away (room=too dark/shower=too cold). ok, so to you regular readers, it’s not much of a surprise that i love looking through the pages of country living for some vintage & earthy inspired crafts. so, keeping with the light theme of today’s broadcast – i bring you another c.l. favorite! 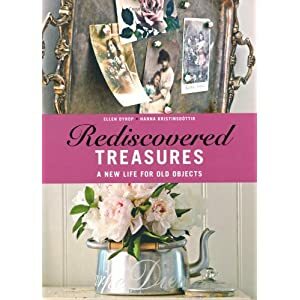 you can also pick up the book where this project originally hails from – Rediscovered Treasures by Ellen Dyrop & Hanna Kristinsdottir – it’s all about rediscovering & repurposing old vintage wares – i just ordered my copy – only $9.99 from amazon!